Did you go to college? Hopefully a liberal arts college? Even if you didn’t, think back to some late night with your buddies, maybe a little weed was smoked. Or in some dopy poly-science class with the one know-it-all jerk who would always shoot up their hand to give some long running opinion about society? Then maybe you have heard of the idea of the social contract. We humans give up some of our freedoms and autonomy to the “state”, or society, in exchange for security. We do this because more things can be done with collective action; there are more benefits to working together than working apart. But to enforce that “social contract” you must play by society’s rules. No murder, or postal fraud; whatever is the rules are. If you violate those rules, “society” in the form of government, or police, or tribunal elders, or whatever, will punish you to keep you in line. What does this have to do with behavioral science? 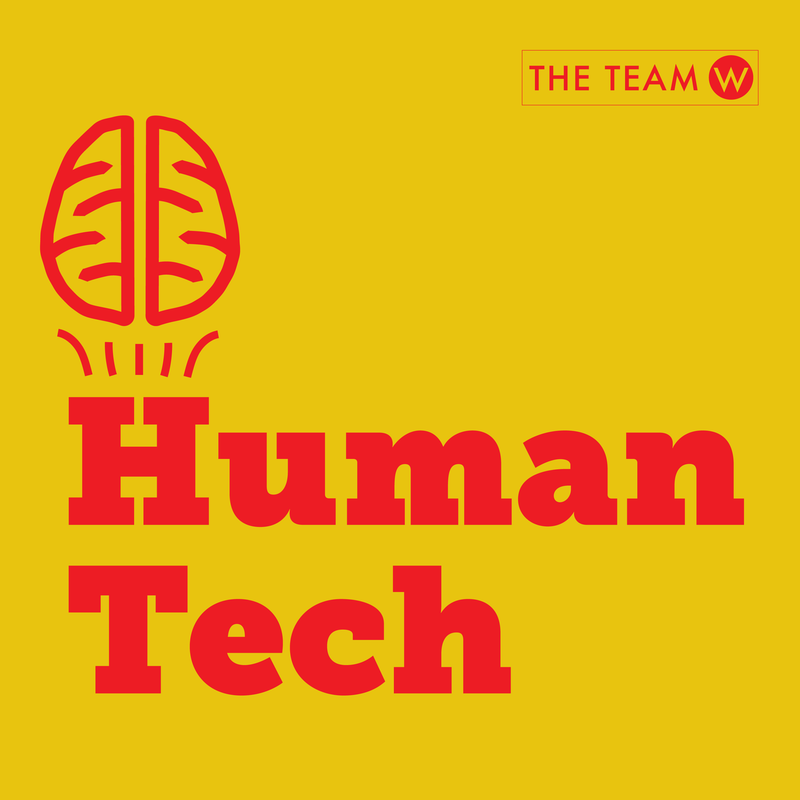 When we start thinking about the dynamics of teamwork or working together, then behavioral science gets involved. And a lot of our interesting social biases show up when we’re trying to do things with other people; especially cooperating. It’s an especially interesting field of research. The specific topic I want to cover is “crime and punishment”. A great name for a book, and a great idea for a behavioral economics paper. People HATE being a sucker. Let’s go on a mind journey. You’re a serf in Eastern Europe in the mid 1500’s. You live in a wooden shack in a small rural town with your spouse and three small children. You and about 15 others are woodcutters. You live near a wooded, hilly region so it’s easy to collect small firewood sticks. With basic hatchets you cut down small trees and chop off small branches. You break those down into yet smaller bits, and smaller sticks yet from those. The sticks are put into carts and pushed by hand up the hill to the governor’s house, who owns the land. He is in charge of the local region, collects the taxes, maintains order, and generally runs everyone’s life; especially the lives of serfs like yourself. The governor provides for each woodcutter and their family with a livable amount of grain and other food each week, as well as a small amount of money. Sometimes you get a little bit of gamebird. Or fresh fruit or cabbage if it’s in season. On occasion some butter. Extra supplies like clothing, or nails may also be acquired with special permission, however they are rare. The governor is more rewarding to the serfs who provide him with more firewood. Firewood is important as it keeps people’s small homes warm in tough winters and provides critical cooking heat. The top choppers get a bit extra here and there as well as first priority for certain favors. You and the 15 other firewood choppers, over many years of chopping, have realized that one of the biggest waste of daylight is stacking the bits of wood into your cart, and then pushing the carts up to the governor’s storage sheds. The push can be made much faster and easier if all the woodchoppers combine the firewood together into larger carts that can be pushed by multiple people. There is less sorting by size, faster moving, and fewer carts, which means more time during the day for actual chopping. So, you gather all the choppers together, and after talking to everyone, you all decide to work together. The plan is to combine some of the firewood together, and then once at the governor’s sheds, divide that wood up amongst yourselves. Everyone has a rough quota they have to fill. Once they fill up their quota for the group, then they can continue chopping for themselves. This way those who cut more still get the credit they deserve, but everyone gets more time to chop more wood to get more food. There’s one troublemaker, Ciszko (real name I checked historical records at about the time), who recently has been taking extra from the group cart. Every day, when he thinks people aren’t looking, he grabs a bunch of wood off the group cart to claim as his own. But he’s been way too selfish, and has gone from a stick or two, to whole bundles he is claiming for himself. A few of the woodcutters have confronted him, and he says he’ll stop, but doesn’t. Each day he takes more and more of the group’s wood. Wood you spent your hard hours chopping. Ciszko is a lazy, slimy dirtbag. You worry that if something isn’t done others will start to steal and your whole group haul will fall apart. He even has had the nerve to ask the guard for extra wool and was given it. Dirty, slimy Ciszko. He lies to your face and steals behind your back. You feel like a sucker. Ciszko needs to be punished. He needs to be taught a lesson to prevent others from stealing from the group as well. Let’s stop this narrative now and move on before this gets too Medieval (in the narrative in the author’s head Ciszko ends up being threatened with the loss of a hand and ends up a finger short). There is value in punishment. What Ciszko is doing is known in behavioral economics, or political science as “free-riding”. Others are doing work, and he is riding off the backs of the work of others. People in today’s modern society really don’t like this. Charity is one thing but being taking advantage of is another. It triggers anger. If there’s anything we humans do really well it’s anger and punishment. We’re really good at it. We love to punish. Why? Because it’s easy. It’s really just the inverse of rewards; the easiest and laziest motivator. It takes very little effort to punish compared to other methods of behavior change. It can “right a wrong”, which satisfies deep emotional feelings we primates have. We are among the few species on earth that go to war or commit genocide. We are tribal, and if someone is undermining the tribe, punishment can be a collective way to restore unity to a group. What’s fascinating is that people like punishment so much that they will punish free-riders even if it is costly for them to do so. Or to put it another way, people will punish even if it is against their own self-interest. They strategically set up a series of games in their experiments with complicated payoff schemes, and times, or opportunities, to see how a group collectively punishes. Experiment 1 had two groups. The first was the “Stranger” group, which was played with random people each round, and the second was the “Partner” group, which was played with the same people each round (10 rounds, or periods as the study called them). In a classic 2×2 condition setup, there were multiple Stranger groups, and multiple Partner groups. The difference between them was that some groups played a game where there were no punishment opportunities, and some played a game that had punishment opportunities. The rules of the game, while simple, are only complicated because of the payoff structure. Each period, each subject in a group gets 20 tokens. They then decide to keep the tokens, or invest the tokens into the “project”. Everyone makes their decisions simultaneously for each round (you won’t know what anyone else does until the big “reveal”). Money that is put into the “project” is magnified, and then split equally between everyone, even if you don’t pay into it. Therefore, while total payout is maximized if everyone fully cooperates by putting all 20 of their tokens into the project, you can make more if you “free-ride”. In game theory we’d say that full free riding is the “dominant strategy”. 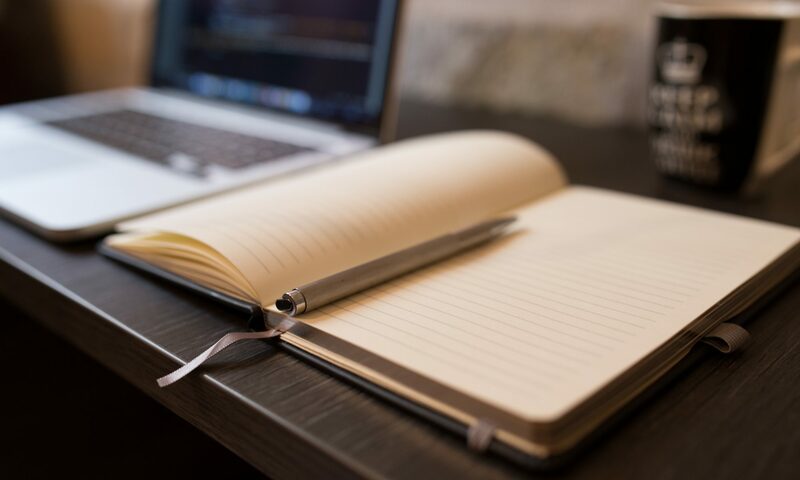 In laymen’s terms, it means your optimal outcome is to keep all of your tokens to yourself but have everyone ELSE put all of their tokens into the project. Because then you get to keep your own coins, but also get a big slice from the project payout that everyone else paid into. You’re keeping your cake and eating theirs too. It’s a classic free rider game. The rub is that everyone knows this. You and everyone else thinks hmmm… If I put my coins into the project they’ll just be going to everyone else. No one else is going to put their coins in, so why should I? In this game, the dominant strategy per game theory (the strategy that will always happen), is that everyone keeps their coins. Everyone free rides. But that’s without punishment. And that’s why there is a second decision stage. After everyone keeps or puts in their tokens to the project, and the big reveal happens, subjects are given the opportunity to punish each other by assigning so-called punishment points. This also happens simultaneously, so there’s a big reveal to see who is punishing whom all at once. If you are given a punishment point, your payout is reduced 10%, all the way down to 0%. So if people don’t like you, they can send you home with nothing (10 punishment points means your payout is reduced 100%, or down to 0). So what happened? To measure cooperation the researchers used the median and average contribution to the project each period. Median again is like average, but instead of adding together and dividing by the number of things, you just put each result in a line and pick the middle-est number. That’s the median. As you can see, when there was punishment, many more people cooperated by contributing their tokens to the project. 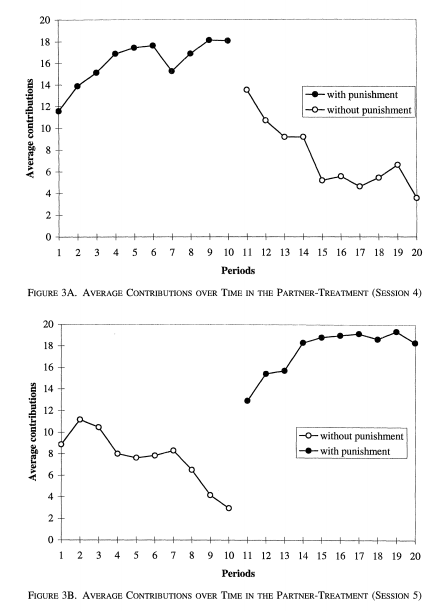 In all groups without punishment, the average contribution starts decent, around about 8, but then falls off to around 2. There’s still some jolly goodhearted people who just want to work together, but by the end of the game, everyone figures out the dominant strategy, which is to be selfish and keep all of your tokens. Meanwhile, in the punishment rounds everyone figures it out pretty fast. Pay your tokens into the project, or you’re probably going to get punished. Sure, someone will try and be cute every round or so and try to grab some here and there and get away with it, but most cooperate. Let’s look at the Partner groups’ graph. Unsurprisingly, the effect is even stronger because you play with these people multiple times. You know who the trouble makers are, and the group can quickly come together and act to punish because of the bonds of trust of working together in the past. Whereas the highest the stranger contribution rounds ever got to was about 14 tokens contributed with punishment, average contribution per person for the Partner rounds was over 19, almost 20, or complete cooperation. That’s an interesting insight. 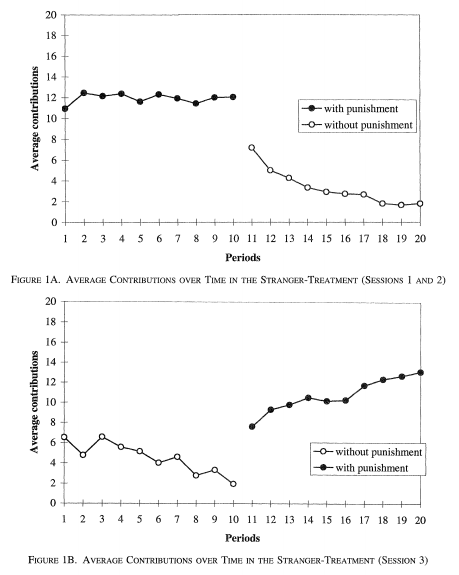 But the really fun stuff is when the researchers looked at when and how people decided to punish. It’s probably not something you would have thought about or mapped out. Most people would dole out punishment when it felt right. So, when does it feel right? What do people feel is just? The magic number it turns out was not how much someone gave to the project. The magic number was how much someone gave relative to the average contribution of other group members. The researchers looked specifically at how far away each person was for each round from the average contribution to the project, and how many punishment points were applied. For those who tried to freeload 2-8 tokens less than the average, they received on average 3 punishment points, and in the Partner group it was slightly higher than the Stranger group. For those who tried to freeload between 8-14 tokens less than the average tokens contributed, those people were punished with about 5 punishment points (again with the Partner group being slightly higher). And for those who freeloaded between 14 and 20 points less than the average (the most anti-society), they were hit with the same average 5 punishment points in the Stranger group, but walloped with an average of 7 punishment points in the Partner group. Remember, for each punishment point you get, you lose 10% of your tokens, so getting 4 punishment points is twice the punishment as getting 2 points. All sorts of interesting gems can be learned from this. When it comes to strangers, not playing along is bad, and we will punish strangers, but at a certain point there is a leveling off. So takeaway, if you’re going to freeload, or steal from strangers, freeload either small enough to get away with it, or big enough for the punishment not to matter. A possible real world example could be international corporations in a new country using some unseemly business practices to drill for a bunch of oil while ignoring some local laws. This study would suggest that if that is indeed your position, either do small stuff or keep it under the public eye to get away with it, or do it huge, get all of the resources out, and get punished. The punishment will be moderate whether or not you transgress moderately, or severely. However, if you are freeloading, or stealing, from people you know, aka, part of your community, the harshness of the punishment knows no limit. The worst punishments are reserved for those who know the societal rules and ignore them. Perhaps strangers are given the benefit of the doubt that they are ignorant of the societal rules, and therefore are not punished as harshly in extreme circumstances. Perhaps, when it comes to strangers, there is a natural inclination to not burn bridges. We ought to punish this stranger so he or she understands our societal rules, but not so severely as to completely turn them against us. Perhaps the intuition goes, if we are moderate with a stranger, they will learn and assimilate into our cultural norms. Maybe that’s how societies and cultures grow and flourish; through the moderate punishment of strangers. Perhaps we assume strangers are out to get us (stranger danger! ), so when they act wrongly there is no surprise, and therefore no shock, and therefore moderate punishment. But when a “friend” (someone within the social circle) breaks those societal rules it is a surprise, and therefore a shock, and feels worse because of the framing. And that leads to harsher punishments. Next takeaway, and I quote the paper: “The more an individual negatively deviates from the contributions of the other group members, the heavier the punishment.” So when you are in a group, or making a decision as an organization that’s in a bigger group, look to everyone else. If you want to stand out, just figure out what everyone thinks the average is, and then stick to that. It doesn’t actually matter what the real number is, the only thing that matters to avoid punishment is what the mini-society thinks is the real number. For example, let’s take tech company’s privacy policies. If a majority of American’s believe that large tech companies have little or no policies for consumer privacy, that’s the societal standard; even if in fact most large tech companies do provide many consumer protections to protect users’ privacy. Behavioral economics theory would suggest that if you’re a new company looking to maximize profit you should have little to no consumer privacy policies to make more money. The group members (the public) do not see you as deviating from the average and you will not be punished. Now you might lose business to other companies, but that’s because privacy is part of the product value. It’s an economic argument over value, not a punishment risk. Here’s another interesting takeaway, and it’s about consistency. The Stranger groups did not contribute to the project at high rates. Therefore, when punishment was doled out the overall income of all the players combined went down. At least in the Partner group the overall income could go up because punishment of freeloaders leads to increased project contributions, and therefore overall higher incomes. But if one punishment opportunity is missed, and people feel they can “get away with it”, everyone runs to their “own interest” corners and the cooperation breaks down. To achieve maximum social good, it requires consistent and reliable punishment 100% of the time. There are very good arguments to be made that the criminal justice system is often rather inefficient at stopping crime because of the inconsistency of the punishment. Cocaine use is illegal and heavily punished by the penal codes, but only a tiny fraction of people using cocaine are ever actually punished by society for their use (they don’t get caught). And when they are caught the punishments are often so harsh they can turn members of the group against the punishment. Conversely, professional sports strongly relies on the consistency of punishments. Players know exactly how much they will be punished (ideally) when they transgress, and they know the punishment will be immediate. If you want to stop goaltending, call it every time and award a basket to the other team on a shot attempt. The action almost immediately stops. Meanwhile travelling in the NBA is called very sporadically, and players often commit small travels without consistent punishment. The result? Lots of players travel, even though the punishment is about on par with a goaltend (I would imagine both are worth about on average 1.1 points, the value of the average possession in the NBA). And one last take-away. If you want to destroy a society, from a parent-teacher organization, to the Galactic Senate, and completely collapse it from within, all you have to do is figure out how to make punishments for breaking the social norms inconsistent. As soon as that happens everyone will run to their own best interest corners, and the society will lose its economic collective advantage and disintegrate. The best and most famous example in history perhaps is the appeasement strategy leading up to World War II. After World War I the League of Nations and been formed, and with it a society of nations to collectively punish those rogue states that broke the norms of the world. It worked for two decades, but as soon as it was tested (mainly by Hitler during his annexation of Austria, and further expansions) and was not punished consistently, the actors who wanted to break world nation norms did so (Japan invading the Pacific, Italy, the USSR, etc…), and the League of Nations collapsed. It was replaced by a new society (the Allies), and later, by the UN. But the strategy of deterrence, or consistent punishment if norms are broken, has been the most effective strategy in the world of political science. Let me know if any of these many lessons from this study have made it to your society, and if a change from you helped stop freeloaders. Remember, if you want to create a culture of trust and cooperation, the group needs punishment to form collective action. Next PostNext How do you build a culture of trust?